Gold milestone… Elmerraji’s “bold contrarian forecast”… still more nonspecific reader feedback… and more! “Man shot after gunfire outside police station in 18th arrondissement of Paris, CNN affiliate BFMTV reports” (CNN). Then I turned on the top-of-the-hour radio news from ABC at 7:00. The lead story was that nobody won the Powerball jackpot last night. And people ask me why I left the news biz. The longer the mess in China goes on, the more it looks as if Chinese leaders have no clue what they’re doing. The action in the Chinese stock market today was much like Monday’s. Only faster. No sooner did the market open than the CSI 300 index tumbled 5% and the “circuit breaker” mechanism kicked in, shutting down trading for 15 minutes. During that 15-minute pause, sell orders flooded in… and when the market reopened, the CSI 300 was down 7% on the day. Under the circuit-breaker rules, the market was closed again for the rest of the day. The trading day lasted all of 29 minutes. Shortly after the market open in the U.S. today, they announced the circuit breakers are suspended. Seems Chinese leaders have now figured out their interventions have been doing more harm than good. Well, not all their interventions. Tomorrow brings the expiration of a six-month ban on stock selling by anyone who owns more than 5% of a company’s shares. The ban will be replaced next week by a slightly less draconian rule that says large shareholders can sell up to 1% of a company’s shares every three months… as long as the selling is disclosed 15 days in advance. “The China Securities Regulatory Commission said the new rules should help to stem panic-selling,” says the Financial Times. Right… Pull the other one. There were two proximate events for the selling in China. The first was yet another devaluation of the yuan against the dollar, the better to goose Chinese exports. That’s eight days in a row, in case you’re keeping score. More significant was the disclosure that China’s foreign exchange reserves tumbled 3.2% in December, to $3.3 trillion. That’s a record one-month drop. Eighteen months earlier, China’s forex reserves totaled $3.99 trillion. That’s a massive flight out of yuan and into dollars by Chinese businesses and citizens. No, it’s not solid gold, just gold painted. The AFP newswire tells us construction was funded by “a group of capitalists” for $460,000. 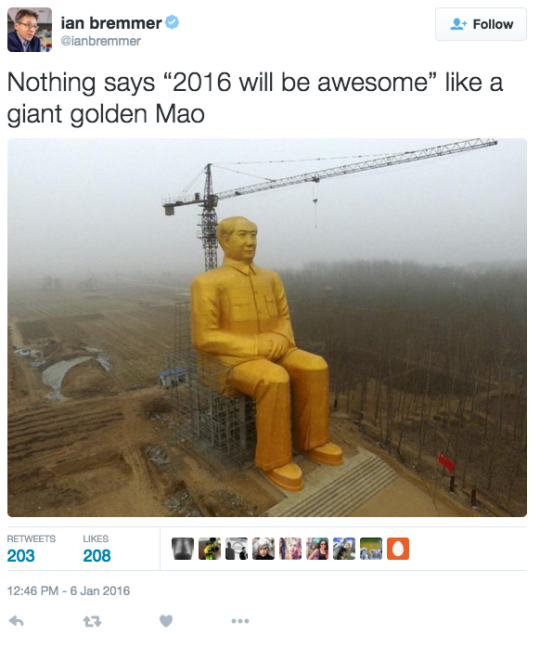 The statue is 121 feet tall, looming over Henan province — site of a famine caused by Mao’s “Great Leap Forward” in the 1950s. “No one knows better than the Chinese Communist Party leadership what would happen if… jobs were not available,” wrote our Jim Rickards in his 2011 book Currency Wars. Just recall the names of a few episodes from your high school world history class: the Opium Wars, the Boxer Rebellion, the Japanese invasion, the aforementioned Great Leap Forward, the Cultural Revolution. You don’t have to know all the details. You just have to know that all that history was compressed into a span of only two human lifetimes. With that historical context in mind, we turn to today’s edition of the safety trade. The Dow industrials opened down 300 points but recovered after word that China’s circuit breakers had been suspended. At last check, they’re down 132 at 16,773. The S&P 500 is off less than 1%, at 1,972. Overnight, West Texas Intermediate crude dipped below its Panic of 2008 lows of $32.40… but it’s since recovered to $33.90. Treasuries are holding steady, the yield on a 10-year note just below 2.2%. It’s gold that’s the major beneficiary of today’s action — pushing past $1,100 for the first time since November. The market turmoil is such that as of this morning, futures on the Federal Reserve’s benchmark fed funds rate (yes, such a thing exists) indicate the Fed will delay its next rate increase from March until June. Adding to that perception is the minutes from the Fed’s December meeting, released yesterday. They reveal no small amount of trepidation among Fed pooh-bahs about inflation stuck below the Fed’s 2% target. Jim Rickards doesn’t buy this delay talk, though. On Twitter this morning, he says a March increase is still in the works as long as the S&P 500 stays above 1,700. Again, it’s 1,972 this morning. For all the pain in biotech during 2015, the sector ended the year up 10% — as measured by the Nasdaq Biotech Index. That’s a darn sight better than the S&P 500, which was slightly in the red. About half of those gains have evaporated in this week’s sell-off… and the portfolio in Agora Financial’s FDA Trader has been hit as well. “But,” says editor Ray Blanco, “I expect we will eventually see gains when these biotechs succeed in reaching important drug development goals — including trial completions, FDA filings or new drug approvals. Ray’s colleague Stephen Petranek will be here next week with his biotech forecast for 2016. The newest batch of Hillary Clinton’s emails during her time as Secretary of State reveals a golden motivation for Western regime change in Libya during 2011. For a long time, we thought it was just an interesting coincidence that Libya’s strongman Col. Gaddafi became a target not long after he proposed a “gold dinar,” a single currency for African and Muslim countries. 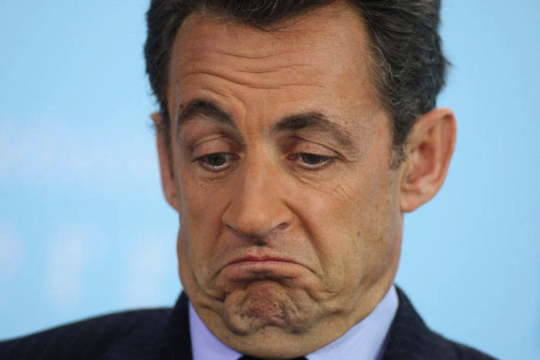 Turns out French President Nicolas Sarkozy — who led the anti-Gaddafi effort among European leaders — was obsessed with Libya’s precious metals stash totaling 143 tons of gold, and nearly as much silver. Why? Well, understand that France’s colonial tentacles still reach deep into Africa. And one of the tools of control is a currency called the “CFA franc.” It’s guaranteed by the French Treasury, trades at a fixed rate to the euro and is circulated throughout more than a dozen former French colonies in Africa. “This gold was accumulated prior to the current rebellion,” it reads, “and was intended to be used to establish a pan-African currency based on the Libyan golden Dinar. This plan was designed to provide the Francophone African Countries with an alternative to the French franc (CFA). Really? We were told it was all about the poor threatened civilian population of Libya. “Likewise!” begins today’s mailbag with yet more nonspecific feedback. Three days in a row now. “Jonas Elmerraji is certainly going against the consensus view at this point by looking for any increase in the S&P this year, let alone a double-digit increase,” writes a reader responding to yesterday’s episode of The 5. “Kudos for making a bold contrarian forecast, even if I don’t believe it at this point. “If you hear fire alarms and see smoke and everyone is running for the exits, it probably isn’t a good idea to be contrarian and stay in your seat until you actually see the flames. “What is up,” reads a related inquiry, “with Agora’s periodic email mentions of your iconic guy ‘at the trading desk’? “Whenever I see that mentioned, I think to myself… ‘Why do they think it’s of any value to me or other subscribers to be told they have ‘a trading desk’? What exactly is that? Why would we care? It makes zero sense to me. “Actually, it’s beyond senseless — it’s annoying that you would mention something so ambiguous in your correspondence. If there’s some reason why we need to know… some value we can gain from this mystical knowledge… then please do ‘pray tell’ us. The 5: Well… you might have a point. Someone else wrote in a while back, wondering whether we actually have a “trading desk” in the same way a firm on Wall Street does. The answer is no, because we don’t manage money. “Trading desk” has been convenient shorthand we’ve used to distinguish Jonas Elmerraji and Greg Guenthner from all our other specialists — macroeconomics (Jim Rickards), income investing (Zach Scheidt), natural resources (Byron King) and so on. Perhaps it’s time to retire the term and call them what they are, trading specialists — the members of our team focused on short-term opportunities driven by chart action. P.S. As a reminder, chart chimp Jonas Elmerraji’s $2 Million Trading Challenge gets underway one week from today. Jonas is out to make his premium subscribers a total $2 million this year. And he wants you to grab a share of it. You can see the proof for yourself during an exclusive event on Thursday, Jan. 14. No previous trading experience is necessary. You don’t have to know a trend line from a hemline. Folks who’ve taken part in Jonas’ previous challenges have generated remarkable gains. One topped $30,000 in a month. Participation in this event is absolutely free. All we need is your email address and you’re in. Here’s where to sign up.